The name Nobscot is derived from the Algonquin word Penobscot, which means "the place where the rocks open out." The colonial settlers in the area shortened it to Nobscot. In the earlier colonial era it was known as Brackett's Corner, named for Solomon Brackett, who owned a bakery on Edmands Road late in the 18th century. 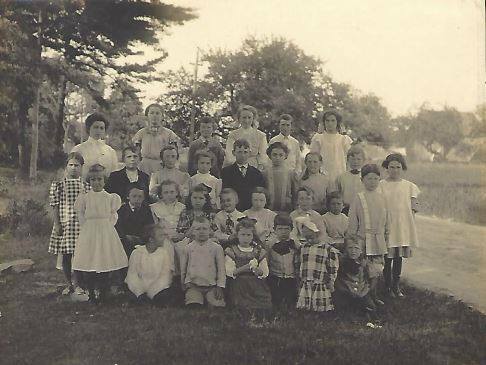 Still the most undeveloped section of Framingham, Nobscot was a sleepy village consisting of a chapel, a school (see photos below), and a combination post office/library, surrounded by farm fields and orchards, until the suburban boom of the 1950s. There are still numerous 18th and 19th century homes within Nobscot - just look for the date board, which lists the date it was built, and sometimes the original owner or use, mounted on the front or side of the building. Here are just a few highlights from Nobscot's history, both distant and recent. The farms of Nobscot give us a present-day link to the town's centuries-old agricultural traditions. The Eaton family homesteads provide a glimpse of the architecture of early 19th century Nobscot. 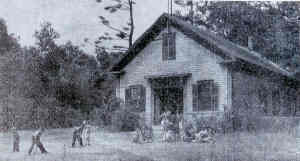 The fields and woods of a Nobscot estate became the setting in the 19th century for the first fox hunting club in New England, and the third in the United States, the Millwood Hunt Club. One of the most notable and admired historic homes within the Nobscot village area is the John Moore House at 807 Edgell Road. The largest commercial enterprise prior to the post-war suburban build-out was the Nobscot Spring bottled spring water company, which tapped its product at the base of Nobscot Hill. This era brought the village landscape that we see today, including the numerous subdivisions of single family homes, apartment buildings, shopping plazas, the fire station, and what is still today the area's only traffic light. One of the remaining non-residential buildings from 19th century Nobscot village is the tiny building on Water Street that formerly housed the post office, library, and railroad ticket office. In more recent history, Framingham filmmaker Raouf Zaki brought a bit of Hollywood to Nobscot several years ago when his award-winning short film Just Your Average Arab used Nobscot Convenience Store on Edgell Road as the setting for the film.